Padraig Harrington’s British Open title defense ended with a three-over 73 for a 12-over-par total of 292, but he defended the swing changes which have come under scrutiny after a poor season. Harrington, a double major winner in 2008 and going for a hat-trick of British Open titles at Turnberry, spent the winter re-modelling his swing and results have been disappointing. 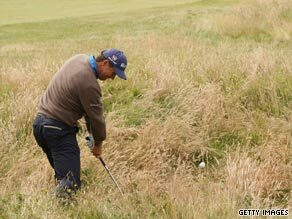 He came into the British Open off the back of five missed cuts in PGA and European Tour events, but remains undaunted. “I suppose I like all this stuff, I’m intrigued by it all,” he said. “I always want to get better and this is a way of getting better. I will be a better player as a result of this and I will have the last laugh.” Harrington, who fniished his round before the leaders had started on Sunday, was never a factor after narrowly making the halfway cut by one shot. The popular Dubliner was bidding to match the hat-trick of titles last achieved by Australian Peter Thomson from 1954-56. The 37-year-old Harrington lifted the Claret Jug at Carnoustie in 2007 and again last year at Royal Birkdale, becoming the first European since James Braid in 1906 to successfully defend the title. Despite his poor scoring, Harrington said he could see signs of improvement ahead of his defense of the U.S. PGA title at Hazeltine next month. “There was a lot of good bal) striking out there this week. This is one of those weeks I will put into the category of ‘This wasn’t my week’. “Going forward I would have no problem playing competitive golf the way I played this week.” He is set to take two weeks off before beginning his build up to the final major of the season.